Buffalo Blitz™ Slot: Play Online at PokerStars Casino! Buffalo Blitz™ is a supersized Slot that has more reels, more winning combinations and more free spins rounds – not to mention more fun – than most other Slot machine games. Created by Playtech, this fantastic game is well-known for its big multipliers and the stampede of thrills that begins to rumble towards players once the Free Games features. Set in the plains of North America, Buffalo Blitz™ is a game where buffalo meet lynxes, moose meet bears and diamonds wait to be discovered by those who dare to explore the vast wilderness. You can discover Buffalo Blitz™ for yourself right here at PokerStars Casino. Why not use the welcome bonus package that awaits every new player to enjoy this exciting Slots game? The first thing everyone notices about this game is that the Buffalo Blitz™ Slot does not play on five reels, unlike the majority of the most popular Slots out there. 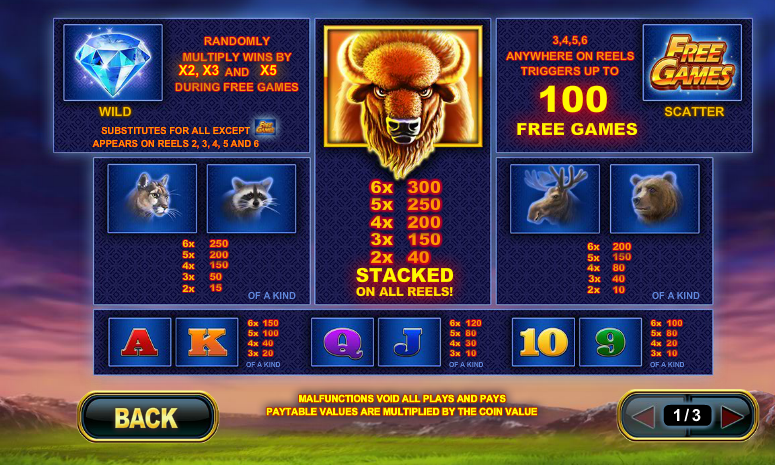 Instead, Playtech added one more reel to make Buffalo Blitz™ a super-sized six-reel Slot. As well as a sixth reel, the all-ways-win mechanic delivers a thunderous 4,096 Ways to Win. With six reels, and wins paying both left-to-right and right-to-left, there's no shortage of winning combinations in Buffalo Blitz™. Don't get overwhelmed by the six reels and the Ways to Win, though. 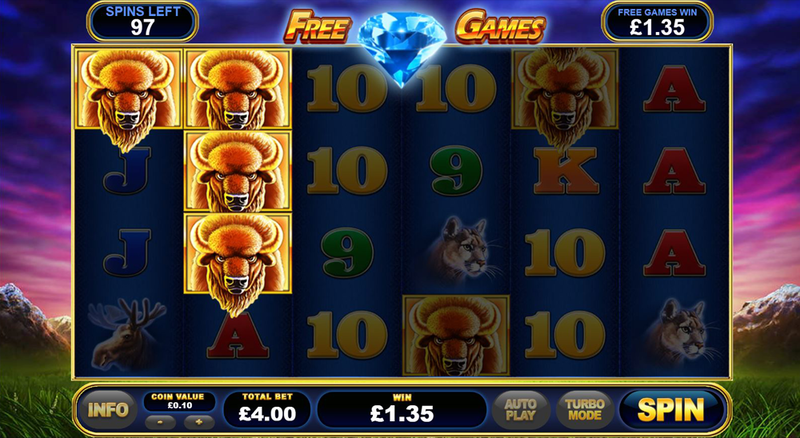 Buffalo Blitz™ is a very easy Slot machine to play. While some of its specific features make it stand out from the competition, the overall mechanics of the game are pretty standard and precisely what you'd expect from a classic Slot. As you explore the six reels, you will discover symbols depicting the animals that roam the plains of North America; Buffalo, Racoons, Skunks, Lynxes, Bears, and Moose are always ready to help you build a winning payline combination and take home a nice win. Appropriately enough for a game set in the American wilderness, this game also features a wild symbol; it's a shiny diamond that can appear on all the reels and can substitute for all the other symbols except the Free Games scatter. As if exploring the plains of North America wasn't exciting enough, Buffalo Blitz™ comes with a blitz of bonus features that players love. What kind of online Slots fan doesn't love Free Games? Exactly – and Buffalo Blitz™ Free Games is a step above most. The scatter symbol, as with many Slots, is the key to hitting the Free Games. Landing three or more on the reels will trigger "only" eight free games, but more scatters means more free games. Four scatters gives you 15 free games, five scatters will net you a fantastic 25 free games, and six scatters will give you the biggest reward the game can offer: a whopping 100 free games! It doesn't end there, though: during your eight to 100 spins, if you hit another pair of scatters you will re-trigger the feature, giving you the opportunity to hit another set of 100 additional free games. Last but most certainly not least, Buffalo Blitz™ also features a Random Multiplier that can boost your winnings and add some extra coins to the already-tasty wins that the base game can offer you. See the paytable below for more information on this. To activate the Random Multiplier and see your wins grow up to 5x, you simply need to land the wild symbol on a winning payline during a Free Games round. With six reels on which to play, and 4,096 Ways to Win on those reels, it's no surprise Buffalo Blitz™ does not follow the same paytable rules as most Slots. As you can see, potential wins range from 10x to 300x your line bet. The game's largest win comes courtesy of a full herd of six Buffalo symbols on the screen. Who Should Play the Buffalo Blitz™ Slot Machine? Anyone who has ever wanted to take a trip to the wildest plains of North America and see how buffalo and bears live in their natural habitat can get the next-best thing across six spinning reels! If you're not the explorer type, though, you'll love Buffalo Blitz™ for what it is: a fun and well-crafted online Slot. With six reels to play on (and the opportunity to trigger hundreds of free games), this Playtech game is sure to keep you busy. Remember, if you see a growing dust cloud on the horizon and can make out a stampeding herd of buffalo, don't be frightened. They aren't charging you down – they're coming to help you win!